Love for the native land is pure and unselfish, and it can be transmitted through music. After all, music is a beautiful and truly boundless area of human culture. The treasures of music, accumulated over the centuries by many generations, are extremely diverse. It is difficult to find a person who could live without music. The power of music can capture the soul, unite the aspirations and thoughts of people. 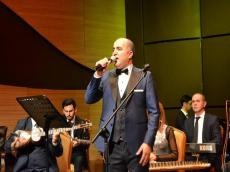 A concert of mugham singer Eldaniz Mammadov was held in the International Mugham Center, Trend Life reported. The event was organized as part of new project "My native land-Azerbaijan"
Accompanied by the instrumental ensemble "Buta" under the guidance of the tar player Rovshan Gurbanov, the songs "Zabul", "Z?minxar? ", "Qaraba? ?ik?st?si", "Sar? g?lin" and other folk songs sounded at the concert. International Mugham Center implements various projects directed to the propaganda of national and world music: "A? ?q musiqisi ax?amlar?" (Evenings of ashug music), "Sirl?r x?zin?si" (Treasury of Secrets), "Unudulmayanlar" (Unforgettable), "Etnik musiqi incil?ri" (Pearls of ethnic music, "Mu?am ax?amlar?" (Evenings of mugham music), "Mu?amat var olan yerd?" (Where mugham lives), "Yeni n?sil d?v?t edir" (New generation invites), etc.